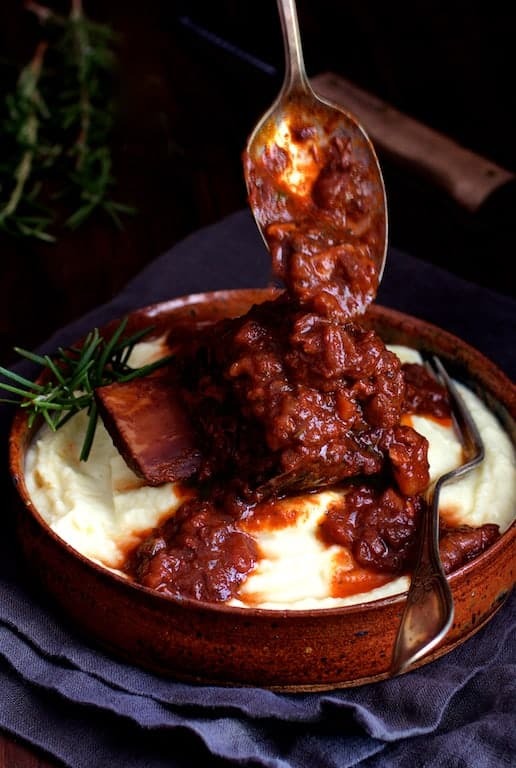 Cabernet Braised Beef Short Ribs are succulent and meltingly tender with intense flavor. Paired with Cauliflower Leek Puree, this is a lovely comforting midwinter meal. I HAVE to do short ribs at least once during the cold weather months. With the weather warming up and forsythia, flowering crab trees and tulip magnolias blooming here like crazy, my time was running out! Our wine collection has been sitting above our living room fireplace completely improperly stored since our flood. We’ve not used our living room fireplace, choosing to freeze over ruining our wine. So, these Cabernet Braised Beef Short Ribs were the perfect way to use a bottle of our displaced wine. Beef short ribs are one of my absolute favorite cuts to braise. Their hunky, clunky and boney appearance can be intimidating. It’s hard to believe at first glance that with a little time, they will be transformed into something meltingly tender that literally falls off the bone. 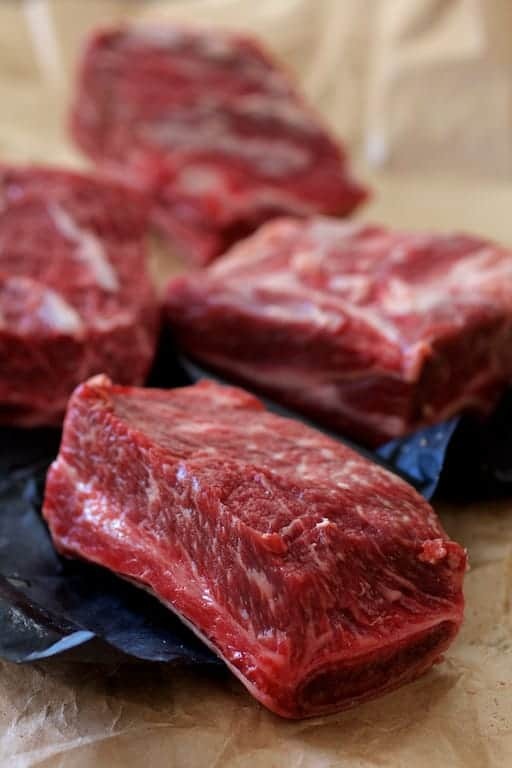 Short ribs have a substantial amount of connective tissue. 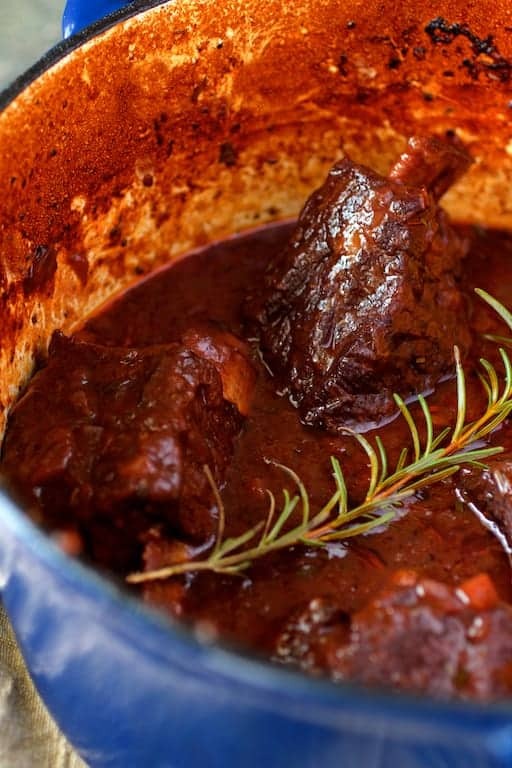 During the braising process, that connective tissue melts away and produces a succulent, tender result. The short ribs I used are half of the whole rib. I once asked my butcher for the full rib and they were ridiculously long and almost didn’t fit in my Dutch oven! A butcher will also cut the rib into thirds but I think those are too small. Half of the whole rib is perfect. If there is plenty of meat, one rib per person will work. However, I like to be on the safe side and do two per person. 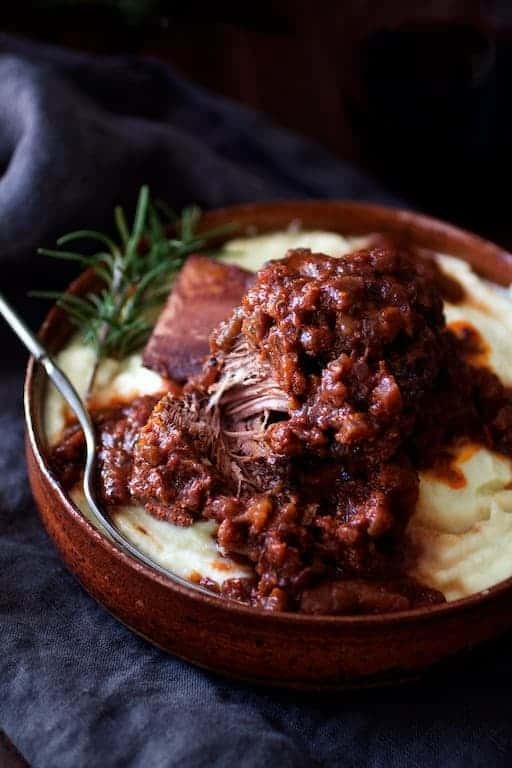 Any leftovers of these Cabernet Braised Beef Short Ribs reheat beautifully or can be shredded and served any number of ways. To get the flavor process going, season the ribs generously with salt and black pepper and brown well in a heavy pot. (Love me a cast iron Dutch oven for braising!) Transfer the ribs to a plate and get the mirepoix cooking. 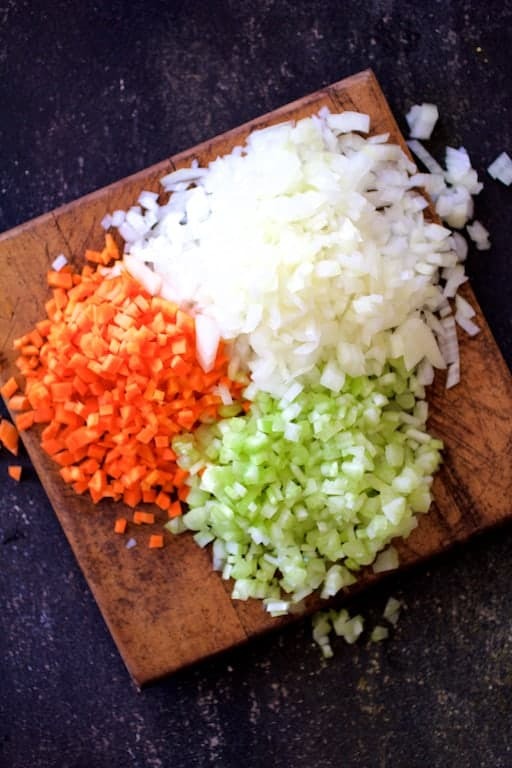 A mirepoix is simply a fancy name for a flavor base that’s a combination of two parts onion, one part carrot and one part celery. It’s typically determined by weight, but I just eyeball it. 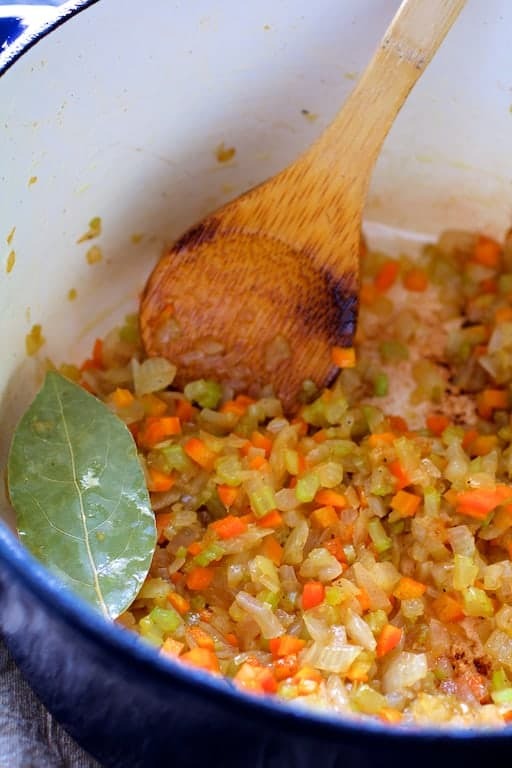 Cook the mirepoix until it’s nice and soft, but don’t brown it. Deglaze with the wine, place the ribs back in the pot along with the other ingredients per the instructions and cover securely. I like to place aluminum foil or wet parchment paper over the pot before fixing the lid in place. Place in the oven and after approximately 2 1/2 hours, you’ll have this gorgeous meaty goodness! When the ribs are done, you’ll have a substantial amount of fat on the top. This can be removed by carefully skimming with a large spoon. A gravy separator also works well. If you have some time, prepare the ribs ahead of time, cool and refrigerate. When the dish is good and cold, the fat will have congealed on top, making it super simple to remove. 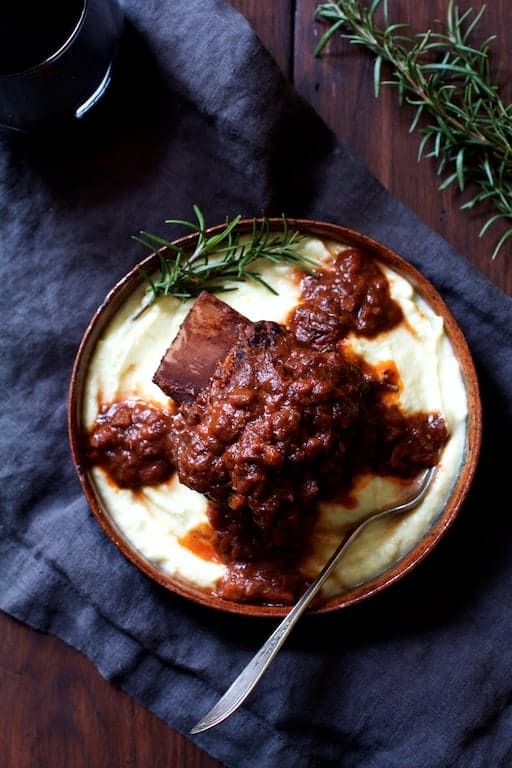 For a slightly more healthy alternative to mashed potatoes, my Cauliflower Leek Puree is perfect with the Cabernet Braised Beef Short Ribs. Now, keep in mind that cauliflower lacks starch, so the consistency will not be like potatoes. It’s a vegetable puree, so it will be on the “loose” side. Remember to clean those leeks well! I show you how in this post. Cabernet Braised Beef Short Ribs! Meaty, wonderful, luscious goodness in an economical cut! Mama! SHORT RIBS: Preheat oven to 325 degrees. Heat olive oil in a Dutch oven over medium-high heat. Season the short ribs with salt and black pepper to taste. Place the short ribs in the hot oil and sear well on both sides, approximately 4-5 minutes per side. Transfer to a plate. Add the onion, carrot and celery to the hot oil. Reduce heat to medium-low, add a pinch or two of salt and cook, stirring often until very soft, approximately 10-12 minutes. Add the garlic, stir until fragrant (15 seconds), then add wine. Bring to a boil and reduce slightly. Add beef broth, crushed tomatoes, Italian seasoning and bay leaves. Place short ribs back into the pot, cover securely and place in the oven. Cook for 2 hours. Add the rosemary and place back in the oven for 30 minutes or until ribs are extremely tender. 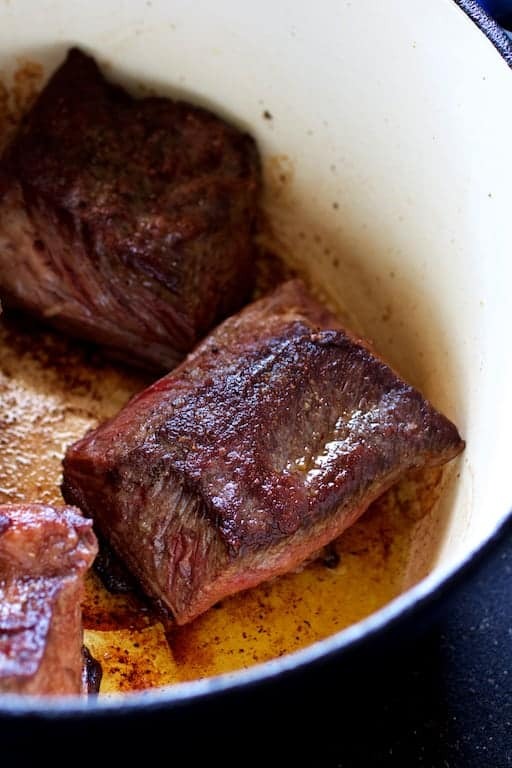 Take short ribs out of the Dutch oven and place in a bowl. Remove and discard bay leaves. Cover to keep warm. Place corn starch in a small bowl. Remove approximately 1/2 cup of the braising liquid. Let it cool slightly then add it to the corn starch in the bowl, stirring to form a thick paste. Whisk the paste into the braising liquid in small batches, stirring well each time. Bring to a simmer over low heat. Cook 3-4 minutes or until thickened. Place short ribs back into the Dutch oven. Let sit off the heat for 10 minutes or so. The sauce will thicken more upon standing. PUREE: Combine cauliflower, leek, garlic and chicken broth in a sauce pan. Bring to a boil. Cover and simmer until cauliflower is tender. Remove the cover and simmer until most of the cooking liquid has evaporated. Add cream cheese and stir into cauliflower until it's quite soft. Puree with an immersion blender or transfer to a blender or food processor and process until smooth. Season to taste with salt and white pepper. SLOW-COOKER: Cook 4 hours on High or 8 hours on Low. I made this for dinner last night. So good. Amazing flavor. Made my whole house smell wonderful. The caulie puree was also fantastic. Thanks for the recipe! Thanks so much, Pam! Glad you enjoyed and hope you’ll stay in touch! Wow. Rainy day today and this looked so good I had to make it for dinner. It was superb. Thanks for a delicious and easy to follow recipe. It was a hit!! Thanks, Clare! Glad you enjoyed and please stay in touch! This was absolutely delicious. I was fortunate because I found a great cabernet for $7.00 that made this sauce mouthwatering. I am definitely going to make it again, but next time it will be during cooler weather; Florida in the spring is kind of hot. Next time I will also drain the cauliflower so it is not so runny. Otherwise I made it exactly as directed and it was yummy. I think I will save this for Christmas dinner next year and double it. Thanks, Afcello! So glad you enjoyed and it would be the PERFECT Christmas dish! I know what you mean about the cauliflower puree. The excess liquid has to be cooked out otherwise it can be quite watery. Thanks again and please keep in touch! I’ve never cooked short ribs – but those look so good I have to think about it! The vegetable puree sounds wonderful, too. Carol, this looks really, reeeeaallly good and it makes me wish we were neighbors so I could invite myself over. Yummy! I love short ribs and the way you have prepared them look fabulous! If I were coming over, you’d have to plan on me definitely having 2 😉 Lovely recipe! Ha! Thanks, Elaine! You’re welcome anytime and I’ll have ’em for you! This looks like real comfort food in these chill days. 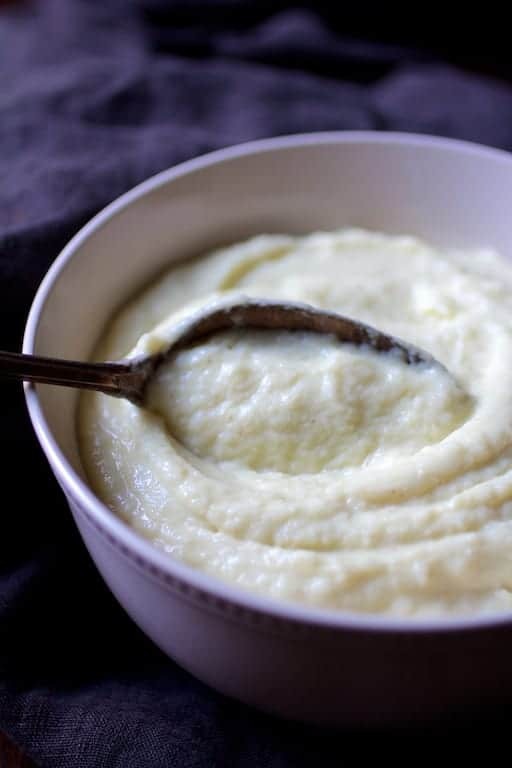 Love your cauliflower-leek puree too…would love to try that soon. Thx for sharing your recipe.